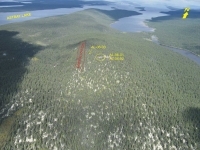 The Astray Lake deposit is located about 53km southeast of Schefferville, 500m northeast of the eastern shore of Astray Lake on the west side of a steeply sided NW-SE trending ridge. With no existing road access, it is only accessible by air or boat. Due to the hard nature of the mineralized iron formation and its differential erosion with respect to other rock units, iron ore mineralization tends to be focal around hilltops. Consequently it is believed that the Astray Lake mineralization will favor a significant amount of lump ore compared to the other soft ore deposits. Fieldwork performed by LIM has noted that the mineralization at Astray Lake consists of banded hematite interlayered with silica (chert) in different proportions. Drilling in 2006 tested high grade mineralization underlying the high silica layers but its total thickness remains untested. The most prospective areas for iron mineralization are on the eastern hillsides along the Astray Lake mountain, which was confirmed by the mineral occurrences identified so far. The deposit occurs in iron formations in the south corner of the Petisikapau Synclinorium, a major structural feature of this part of the Labrador Trough. Localized in the Lower Sokoman Formation of a major north-plunging syncline, the surface outline of the deposit has a northwest-southeast alignment consistent with the distribution of the iron formation generally located along the ridges. The jasper iron formation is not highly metamorphosed and contains more than 40% Fe in the form of hard dense blue to dark grey-black hematite distributed in fine granular textured layers inter-banded with deep red jasper. Some of the jasper iron formation is brecciated, and ore is developed where hard blue hematite cements this breccia or replaces silica in the banded iron formation. Ore is developed up to the top of this member along the contact with the overlying basalt flows. The upper part of the mineralized sequence in contact with mafic volcanics (basalt) consists of high grade, massive to fine grained, weakly-magnetic hematite with estimated <5% silica content and with an estimated thickness of 5 to 7 meters. Mineralization with higher concentration of banded silica ranging between 10 to 50% underlies the high grade mineralization with undefined thickness. Silica bands usually consist of red jasper silica and medium to fine grained sandy textured friable white/light grey silica in thin layers of up to 10cm thick.